When Elizabeth Holmes (pictured right) was a 19-year-old sophomore at Stanford University in 2003, she decided to drop out and start her own company, Theranos. Through her proprietary blood-testing device, which requires a few drops of blood rather than cumbersome vials, she became the world’s youngest self-made female billionaire. Today she sits disgraced, under investigation by US authorities, and facing more than nine lawsuits from disgruntled customers. 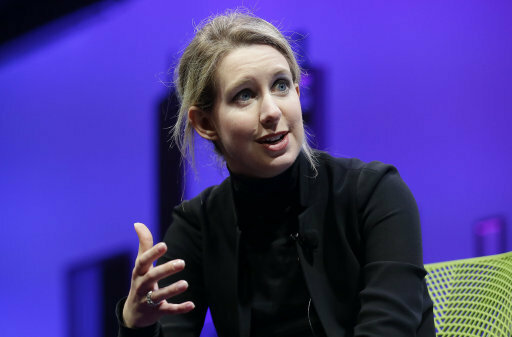 Questions regarding the reliability of the MedTech company’s tests have become the focus of a media firestorm, and recently resulted in Forbesdowngrading its valuation of Theranos from $9 billion in 2014 to just $800 million today. Yet the meteoric rise and fall of Holmes should not dissuade families from investing in the MedTech sector: estimated global revenues are expected to increase to $454 billion in 2019 from $369 billion last year. 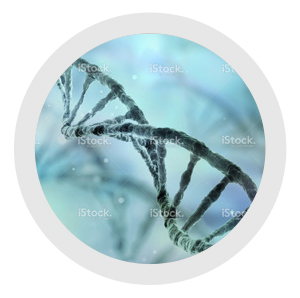 CampdenFO looks at three families that built their reputation on life sciences. Switzerland’s Bertarelli family is best known for building Serono – the third largest biotech company in the world. Founding father Pietro Bertarelli built the business off the back of his work on reproductive science: his drug Pergonal was used in 1987 in the conception of the first test tube baby. Decades later in 2007, the Geneva-based firm was sold to Merck, the German pharmaceutical firm, which today remains 70% owned by the eponymous family, in a deal worth about €10 billion ($11 billion). The Bertarelli family continues to invest in the MedTech sector through their investment vehicleWaypoint Capital. Curt Engelhorn, the great-grandson of the founder of German chemical company BASF, spent three and a half decades at the helm of successor companies Boehringer Mannheim and DePuy. In 1997, he sold the two firms, in which he had a 40% stake, to Swiss healthcare company Roche for more than $10 billion. Today, the Engelhorn family invests in Europe’s most ambitious growth-stage companies through their fund Frog Capital, which was founded in 2008. Several families are among the 14 investors in Frog Capital. While the fund has not disclosed its investments in MedTech, they have expressed a preference for start-ups that look to disrupt their industries, which is a hallmark of the MedTech sector. The fund is looking to make investments in eight to 10 firms based in the United Kingdom, Germany, and the Nordic countries. Medical technology has the potential to improve quality of life for patients and generate profit for investors or inventors. One of the most compelling examples of capitalising on this relationship comes from Michigan’s Stryker family. In 1941, orthopaedic surgeon, inventor and businessman Homer Stryker used his proprietary medical technology to found the Stryker Corporation. His products ranged from mobile hospital beds that reduced bedsores to simple rubber heels for walking casts. Today, Stryker Corporation products include implants used in joint replacement and trauma surgery, surgical equipment, neurosurgical, neurovascular and spinal devices, as well as other medical device products used in a variety of medical specialities. While only one member of the third generation sits on the board, Homer Stryker’s three grandchildren hold significant shares in the corporation, which had revenues of $9.02 billion in 2013. Los Angeles based DxTerity is bringing “Genomics to Everyday Care” by dramatically accelerating the process of validating and commercialising a genomic test. While the promise of genomics and precision medicine is immense, demonstrating clinical utility and Food and Drug Administration (FDA)-compliant quality for a test often requires multiple years and more than $30 million of investment. DxTerity’s patented technologies solve this problem. DxDirect® and DxCollect® provide low cost, high throughput testing capabilities on a large existing install base of clinical instruments. 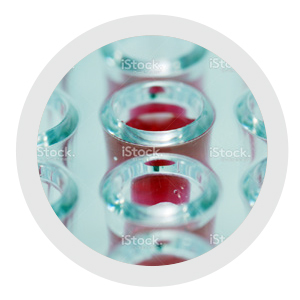 DxTerity’s Direct-to-Patient (D2P) clinical study platform coupled with FDA compliant, ISO 13485 certified product development deliver rapid validation and commercialisation of new tests. D2P solves the “last mile” problem of genomic studies by integrating digital patient recruitment, eConsenting, and patient communication with “From Home”, patient collected blood samples to enable rapid, low cost, population scale genomic studies: Anyone, Anywhere, Anytime. 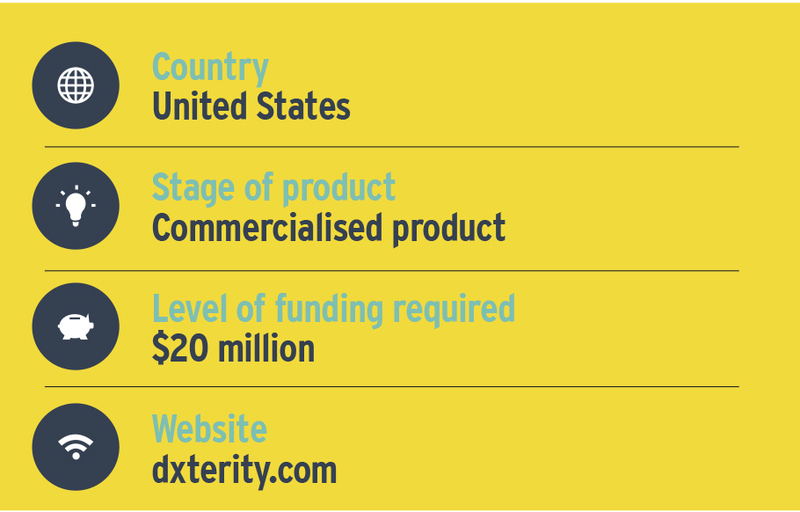 DxTerity seeks a $20 million investment to drive expansion through the commercialisation of multiple high value genomic tests and services that leverage the “From Home” D2P advantage. This is based on 2016 revenues of $7 million and estimated 2017 revenue growth of 200%. FAST BioMedical has an innovative personalised medicine technology to measure blood volume and kidney function safely, easily, and accurately. This clinical-stage technology can be the standard of care in congestive heart failure, major surgery, and sepsis in this $2 billion market. The huge unmet medical need is well substantiated including an United States Food and Drug Administration (FDA) Expedited Review. As one key opinion leader physician states: “This will change how we practice medicine”. Compelling clinical evidence shows that managing sepsis patients by knowing blood volume can cut the high death rate by two-thirds. This technology can impact several high-cost, poor outcome areas that are the focus of hospital networks in the US and Europe. 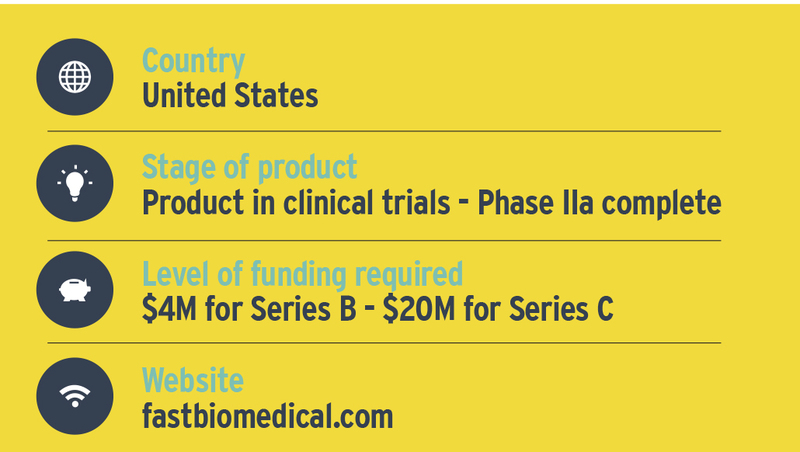 Phase I and Phase IIa trials are already complete, and regulatory approval is achievable by 2019. A global portfolio of 50 patents makes the barrier for competition high. Several distinguished family offices are current investors, including Fortune 500 healthcare chief executives. Equity funding is buoyed by $7 million of non-dilutive National Institutes of Health (NIH) grant funding, of which $2.5 million remains for the next clinical trial. Based in Indianapolis, Indiana, the company has a deeply experienced management team and board of directors with significant expertise from founding through exit. 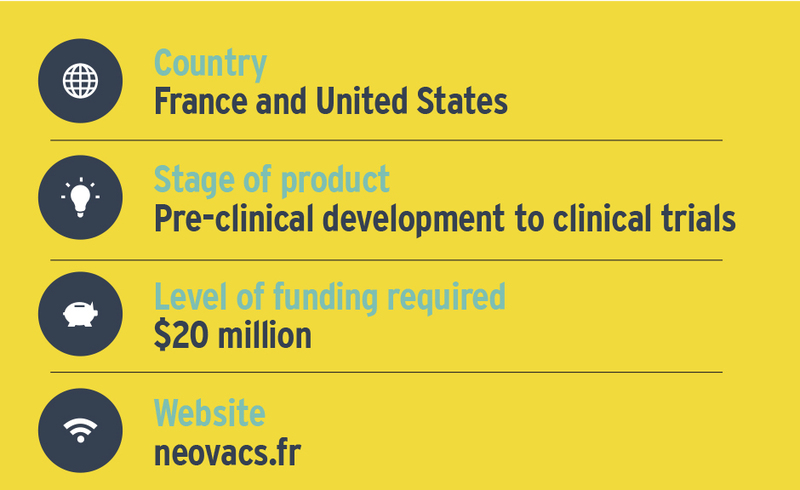 Neovacs is a French biotechnology company, focused on the development of Kinoids, therapeutic vaccines for the treatment of autoimmune and inflammatory diseases and cancer. The goal of the Kinoid approach is to enable patients to have a superior quality of life by providing access to safe treatments with sustained efficacy. 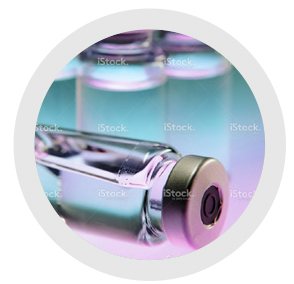 Neovacs is focusing its clinical development efforts on IFNα-Kinoid, an immunotherapy being developed for lupus and dermatomyositis. Neovacs also has several therapeutic vaccines in pre-clinical development for the treatment of autoimmune diseases, cancer and allergies. In July, Neovacs and Stellar Biotechnologies announced the launch of Neostell, a joint venture to manufacture Kinoids. •IFNα-Kinoid in lupus: Phase IIb trial in lupus ongoing in Europe, Latin America and Asia with data expected in the second quarter of 2017. In South Korea, lupus is considered as an orphan disease and more than 1,000 Korean patients are expected to be treated and followed between 2018 and 2020, in parallel to the Phase III trial. •IFNα-Kinoid in dermatomyositis: The study design is ongoing for Phase II trial in dermatomyositis (adults) in Europe which is expected to be launched in the second quarter of 2016 with data expected in the fourth quarter of 2017. 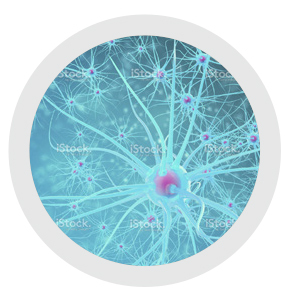 Valencia Technologies has fully developed a platform technology in its tiny, coin-sized and shaped neurostimulator, eCoin, based on underlying science that electrical stimulation of nerves can change the nervous system and improve chronic conditions. Whereas previous neuromodulation technologies were limited by size, cost, and lead wires, the eCoin is produced for a fraction of the cost, is reduced in size by an order of magnitude, and can access the target nerve without lead wires due to the placement of electrode material on the exterior of the coin. These transformative characteristics allow eCoin to be implanted atop various nerves to treat a variety of conditions; hypertension, obesity, overactive bladder (OAB), heart failure, erectile dysfunction, depression, post-traumatic stress disorder, osteoarthritis of the knee (OA), and Parkinson’s. Valencia is led by Jeff Greiner, the former chief executive of Advanced Bionics, who took it from infancy and no revenues into a company with more than 2,500 employees and $300 million in revenue. 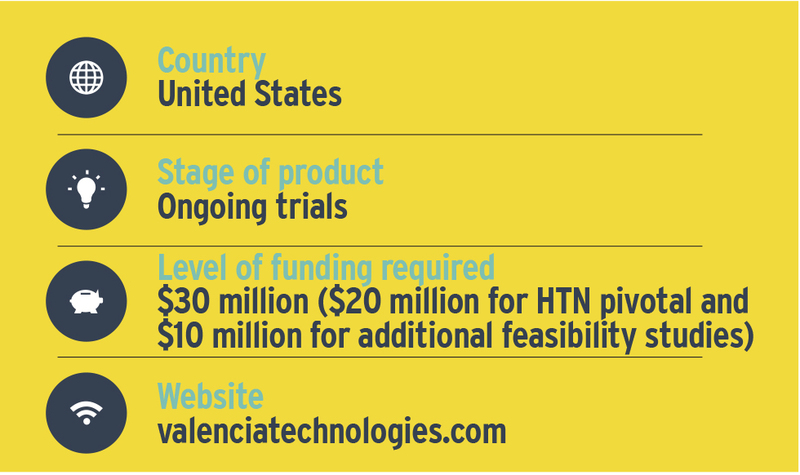 Valencia has not only fully developed the eCoin but has also built out its own ISO certified manufacturing facility, obtained 15 issued patents, and conducted a rigorous international clinical trial for its first application in drug resistant hypertension. With clinically significant trial results, the support of US leaders in hypertension, and the significant need for a non-drug therapy to treat this patient population at high risk of stroke and cardiovascular disease, the company is raising $30 million to conduct a pivotal (Phase III) study in hypertension and feasibility studies for heart failure, OAB, and OA.